My publisher Douglas & McIntyre and I are holding a reader review contest to help kick start the conversation about The Horse That Leaps Through Clouds: A Tale of Espionage, the Silk Road and the Rise of Modern China. 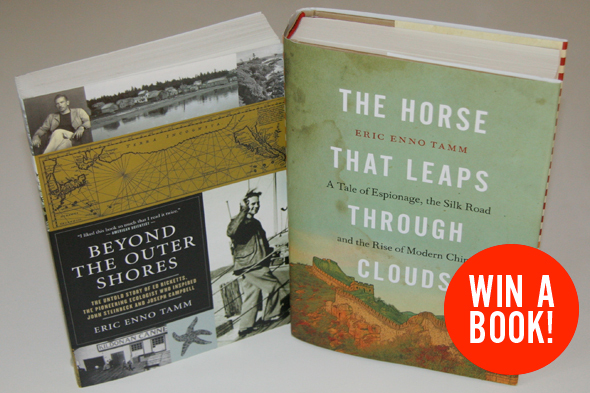 The first dozen people to upload a review on Amazon.ca will win a signed copy of The Horse That Leaps Through Clouds or my first book, Beyond The Outer Shores: The Untold Story of Ed Ricketts, the Pioneering Ecologist Who Inspired John Steinbeck and Joseph Campbell. For more info about the book, click here. Reviews must be a minimum of 250 words and include commentary. Reviews must be uploaded to Amazon.ca and emailed to eric [at] horsethatleaps.com. Readers must include their name and city with the review. Reviews may be published on Horsethatleaps.com and/or the book’s Facebook page. The first 12 reviewers will win a signed copy of The Horse That Leaps Through Clouds or Beyond The Outer Shores. Six copies of each book are available as prizes on a first-come, first-serve basis. Contest not open to family or friends of author or staff of Douglas & McIntyre. This entry was posted on Thursday, April 8th, 2010 at 10:08 pm. It is filed under CONTEST, REVIEWS and tagged with review. You can follow any responses to this entry through the RSS 2.0 feed. Yes, this contest is still open.